Travelling from Moldova to Ukraine became more popular once visas for most nationalities were raised by Moldovian government. Thus travelers going from Romania to Ukraine usually use this tiny sandwitched county for a stop-over and probably wine tasting. 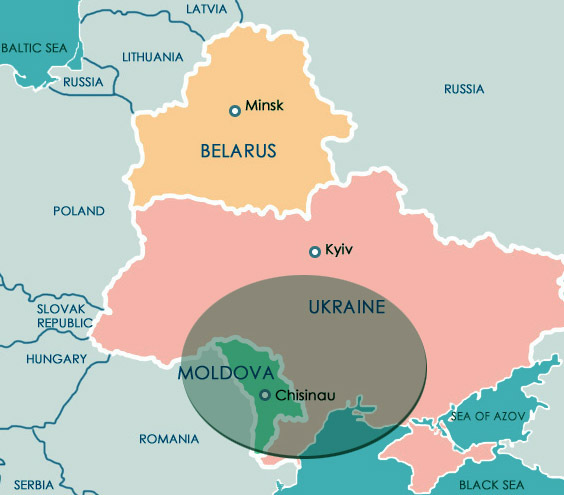 Majority of travelers arrive to Chisinau, Moldavian capital, and then continue to nearby Odessa in Ukraine. Odessa is also a good stop-over on the way to Crimea. There are also direct connections to Kyiv, Lviv and Chernivtsi from Moldova. This is probably the busiest and most popular travel path for people going from Moldova to Ukraine and return. There is daily train operating between Odessa and Chisinau which is a good choice. Even though it crosses through Transdniestr region, there is no need to worry as you don’t get out of it upon a custom check. It departs from Chisinau at 07:20 arriving to Odessa at 12:07 and back it departs from Odessa at 17:11 arriving to Chisinau at 22:14. Buses leave almost every 2 hours from Chisinau North bus station to Odessa. In Odessa buses to Chisinau leave from Privoz bus station. Most buses go via Palanca border crossing point avoiding unpredictable Transdniestr hassle. Fares are about 70 UAH (6 EUR) one way and it takes approx. 7-8 hours drive. As for me train, where you can stretch, have a drink of walk to the bathroom, is better option. If you don’t need unpredictable advanterous in Transdniestr simply take Palanca border point and the road will take you over the self proclaimed republic. However going through Tiraspol might be calm as well. The worst might happen is a forced bribe to the custom officer who is in charge of shift. Two daily trains Chisinau-Moscow stop in Kyiv on the way. One of them #47 departs from Chisinau at 11:37 arriving to Kyiv at 01:58 next day and another is #66 departing at 23:08 and arriving at 12:20. From Kyiv the same trains depart at 4:51 and 8:37 arriving to Chisinau at 17:52 and 23:13 respectively. Cost is approx. 45 EUR. There are two night busses connecting Chisinau and Kyiv. From Kyiv Central bus station departures are at 19:05 and 20:30. The dirve takes around 10 hours and costs approx. 180 UAH (17 EUR). From Chisinau North bus station buses depart at 19:00 and 21:30. A lot of working people travel this route from Moldova to Ukraine and back, so if you have a chance try to get your ticket in advance at least for a few days. Daily night bus operates between Lviv and Chisinau. It departs from Chisinau at 18:35 arriving to Lviv at around 13:00 next day. From Lviv the same bus leaves at 16:30 arriving to Chisinau at around 10:00 next day. This bus also stops in Ivano-Frankivsk and Chernivtsi on along the way. The cost is around 310 UAH (28 EUR). In order to reduce your costs, save time and not to sit in embrion position for 17 hours I recommend taking a train to Chernivtsi where are at least 6 daily buses to Chisinau with cost approx. 120 UAH (11 EUR). Do the same on the opposite direction: Chisinau-Chernivtsi by bus and Chernivtsi-Lviv by train. Chernivtsi is also worth to be seen for a few hours and it is perfect change to Kamenets-Podilski.